My name is Dominic Hess. I was born and raised in Mankato, MN. I moved to St. Paul in 2007 where I lived for a few years before moving to Minneapolis after purchasing my first home with my girlfriend, Jes. I first learned to develop websites in 1995 in an Advanced Computer course in High School. I immediately fell in love with it and knew right then, I had found my calling. I started developing professionally in 1999, and have been doing it ever since. I have just as much fun now as I did when I started. 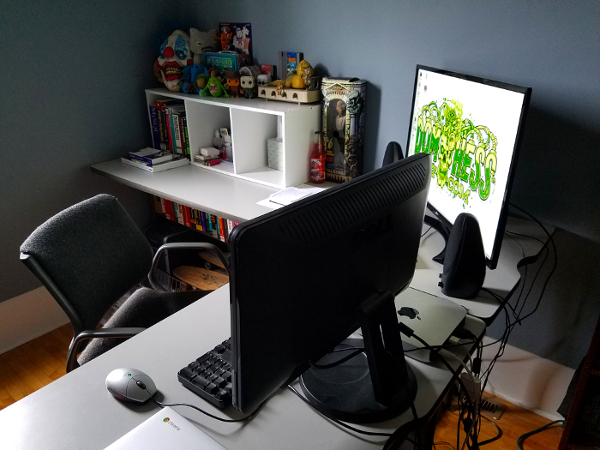 Here's a picture of my work space at home. In my free time I like to get outdoors. I enjoy traveling the United States and have been to 40+ states. Some of which I've been to multiple times and will continue to go back to. I have a 1953 Chevrolet 2DR 210 Sedan that I enjoy cruising around in and working on. Other hobbies of mine include fishing, grilling, reading, collecting, and spending time with family and friends. I'm an obsessive collector of 70's, 80's and early 90's toys. Started collecting in 1995 with the rerelease of Star Wars and it branched out in all directions. I run an online store selling some of those items I've collected throughout the years. You can check it out at Ephantmon.com. I also post items from my personal collection on an Instagram page. If you're interested, you can find those here. I'd say that about sums me up. If you have any questions, please feel free to contact me.